For as long as she can remember, twelve-year-old Emily Windsnap has lived on a boat. And, oddly enough, for just as long, her mother has seemed anxious to keep her away from the water. But when Mom finally agrees to let her take swimming lessons, Emily makes a startling discovery - about her own identity, the mysterious father she's never met, and the thrilling possibilities and perils shimmering deep below the water's surface. 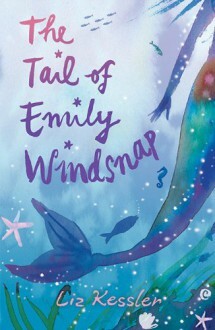 With a sure sense of suspense and richly imaginative details, first-time author Liz Kessler lures us into a glorious undersea world where mermaids study shipwrecks at school and Neptune rules with an iron trident - an enchanting fantasy about family secrets, loyal friendship, and the convention-defying power of love. What is this and why is it in my books? This book was incredible. Incredibly real. It is the wonderful story of a girl who learns new things about herself. Even though we may not discovers we are mermaids, we still discover new things about ourselves every day. Everyone should be able to relate to this fantastical, wonderful story.